Thailand is an ancient land and wherever you wander you’ll discover customs and traditions that are centuries-old yet thrive to this day. In Loei, a prime example of antiquity, is the colourful Phi Tha Khon Festival, where the locals dress in colourful masks, and carry symbols of fertility. The province’s landscape itself is more ancient still formed over millions of years before humans; Thais, tourists or otherwise walked the earth. 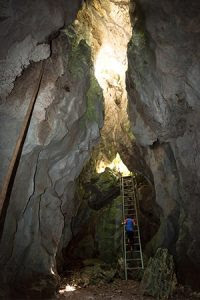 Here, you can travel back in time and explore the geological wonders. 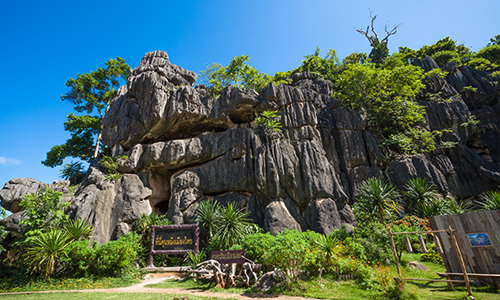 Loei’s Nong Hin region is rich with limestone formations, which were once below Palaeozoic oceans some 540 to 250 million years ago. Over the millennia, these sea-beds were thrust skyward and the result is today’s topsy-turvy landscape. There are huge trees, greenery and vines growing on top of huge barren boulders and cliff faces, as if they’d been planted by garden-loving giants. It’s a landscape so primaeval that you almost expect a toothsome Tyrannosaurus Rex to burst from the undergrowth at any moment. These hills are often compared with the amazing rock formations of Kunming in China where the thrusting crags have inspired local artists and craftsmen for centuries, making the region a tourist magnet. But here in Loei, you often have the limestone’s peaks and caves all to yourself, and this tranquility makes it feel like an untouched Eden. The best place to start exploring is Nong Hin Village, which has a visitor centre at Suan Hin Pha Ngam, a garden area surrounded by an amphitheatre of stone. It’s a popular spot for photos, but if you want to explore the area more deeply, climb aboard one of the nearby e-taen tractor trucks that take you right into the limestone crags. 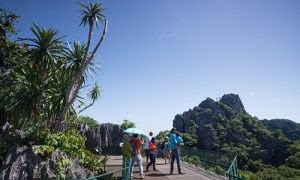 There are jungle trails to follow, but first take the metal steps up to a sturdy metal platform, this is the park’s best viewpoint and you are rewarded for your climb with a 360-degree view of the limestone crags. The locals have named the peaks after the creatures they evoke; a rather flattened turtle is the most memorable but there are also elephant and dinosaur shapes to discover as you descend and continue further along the trail. 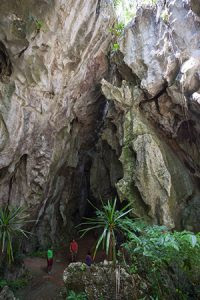 Down the road there’s another Pha Ngam walking trail, and you can actually enter into the limestone itself and explore the caves, hollowed out by dripping water over millions of years. Impressive displays of Mother Nature’s artistry lie deep within. And just like the peaks above, the cave’s ancient stone formations are named after the shapes they take on. In the torchlight you’ll see an impressive mermaid, a shark, two dogs kissing, and various dinosaur body parts. 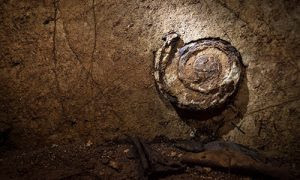 If often takes a little imagination to make the figures out, but there are genuine fossils of ancient sea creatures to be found too, and the guides can show you the best ones. You do need to go with a guide, many of whom are young local students who really know their stuff and the best routes to take; without them you could easily get lost in this Loei labyrinth. At places where the sunlight pierces through the rock, greenery and vines crowd into this underworld and large bats, unaccustomed to visitors flap away over your head, resentful at the disturbance. It’s not unknown to come across the occasional snake either, so watch your step. After ducking through crevices and caves the 800-metre trail eventually leads through hidden orchards and then to the top of the limestone crags where you traverse precarious paths, scale steep metal staircases and feel dizzy at the alarming drops to either side, but the views and greenery make it worth the effort. The difficulty of the terrain means that Suan Hin Pha Ngam is an undisturbed nature reserve; the area is home to a wide array of birdlife and some stunning plants. It can be tough going so you need good footwear and do take water. There are plans to make this trail more user-friendly in the next few months, so to experience the Pha Ngam trail in the raw, it’s worth making a visit now. But whenever you go, this lovely area of Loei is worth seeing and not just because it emulates China’s Kunming. The region is unique in itself and offers walks, waterfalls treks, views, and experiences that few places can match. So come explore this timeless and untamed land – adventure awaits. Nong Hin is around 50 km from Loei town and there are local buses. If you have your own transport, take Highway 201 and follow the signposts. The Suan Hin Pha Ngam part and trails are open from 8 a.m. to 6 p.m. and a guide should be hired. The tractors from the visitors’ centre to the viewpoint are around 20 Baht per person. If you want to walk the trails, strong shoes are essential and a torch would be useful. Take sun screen and plenty of water.